I never thought of pesto as herbal medicine, but indeed it is. 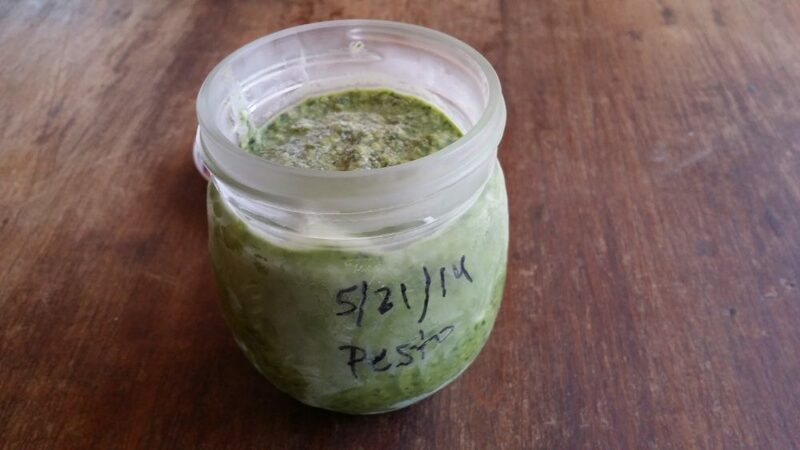 Pesto has earned a spot in my diet (and my freezer), fairly regularly as a result. I mean, think of it, it’s chock-full of herbs. Herbs are medicine. Pesto = Powerful Herbal Medicine. The thing about pesto, for me at least, is that I don’t relish the making of it. I have to lug out my food processor and wash lots of herbs (I like to keep them varied for optimal nutrition). The other issue is that sometimes you don’t want a lot of pesto… you want just a little. Well, that’s not a problem when you’re smart and make pesto ahead of time. When you realize you want (or need) some pesto, it’s great to have it on hand. It requires thawing, but I find that I usually know if I’ll need pesto a day in advance so I put it in the fridge to thaw overnight. I like to make a good sized batch and freeze it in jars of different sizes as shown in the pictures. I especially like these baby food storage jars because the amount frozen is perfect for adding a little of pesto flavor to any dish where you want herbal flare but not a pesto-heavy result. 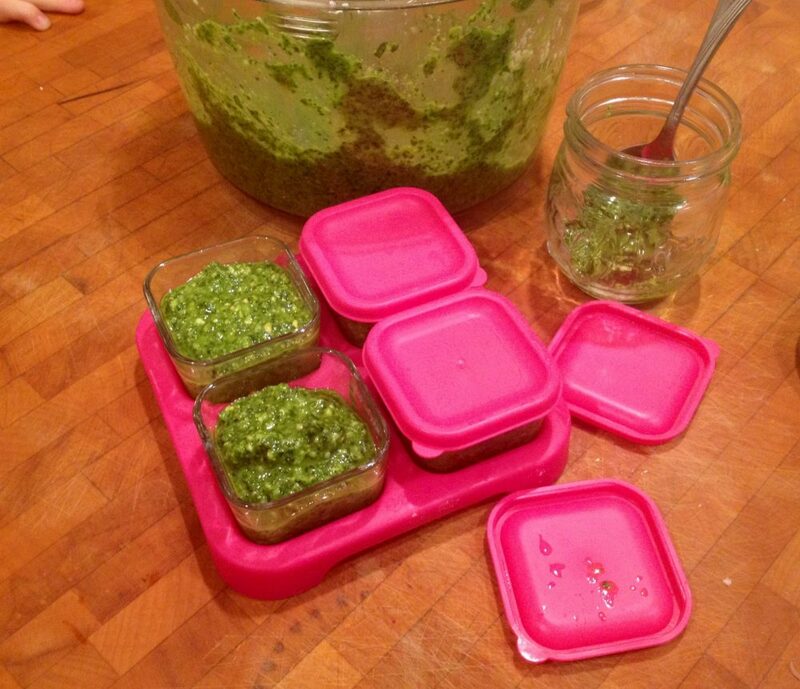 Pesto (#HerbalMedicine) going into little cups for freezing. When I go to the farmers’ market, I see what lovely fresh herbs the farmer has, and I buy a lot. I go home and get to making some pesto straight away so I can be done with it. It feels good to have a freezer stocked of different things that can quickly be thawed for food. 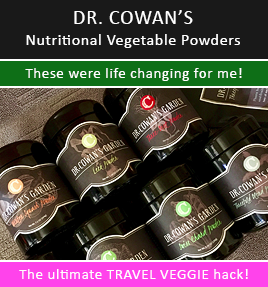 If you haven’t seen my post on Real Food Fast Food, please check it out. I share lots of ways to make really fast meals that qualify as Real Food (healthy stuff). Pesto goes wonderfully served over a grass-fed steak, grass-fed burgers (I buy from Alderspring), pasture-raised chicken (I buy from Good Earth Farms), wild-caught salmon (I buy from Vital Choice). It’s also delectable slathered over some fermented organic sourdough bread, drizzled over mochi, dumped on top of gluten-free pasta, and stirred into organic goat cheese for the best goat cheese ever. You can also add a spoonful of it to the next dressing you make. Holy moly, you’ll be licking the bowl and begging for more salad when you do. Pesto = Powerful Herbal Medicine. Pesto is pretty easy to make even if it’s not my favorite thing to do. However, I am not going to give you much of a pesto recipe because it’s so forgiving. You only need fresh herbs and a couple of other ingredients. I list many herbs below and you can use one or a combination of many. I also prefer hemp seeds instead of other nuts because they’re nice and small, soft, and offer some better nutrition than many other nuts. Place the herbs in a food processor, like this one I have, fitted with the “S” blade, along with sea salt, garlic, hemp seeds, and cheese. Pulse it a bit until it’s nicely chopped. Turn on the food processor and add the olive oil in a steady stream until it’s incorporated. 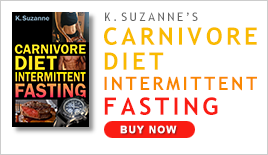 Set some aside to eat, if desired. Transfer the rest into glass storage cups of different sizes to be frozen. Be sure to label them with “Pesto” and the date.